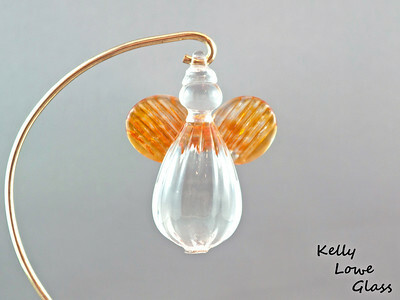 Here you can see examples of the currently available colours of hanging glass angels available at Kelly Lowe Glass. 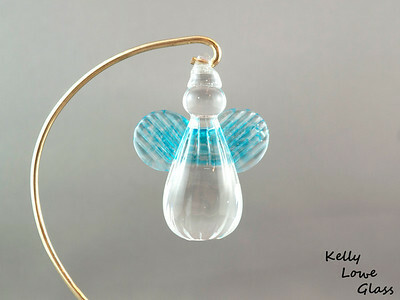 Hanging Glass Angel - Light Blue Height: Approx 8cm (3.15") Across the Wings: Approx 5.5cm (2.17") Depth: Approx 3cm (1.19") Weight: Approx 85g (0.19 lbs) *Brass hanger in pictures is not included Please note: as each piece begins its life as molten glass and is blown/sculpted by hand into the final product, individual pieces might have slight variations in size and/or appearance. Please rest assured however that the standard of quality is quite high, and no substandard pieces will be sold. 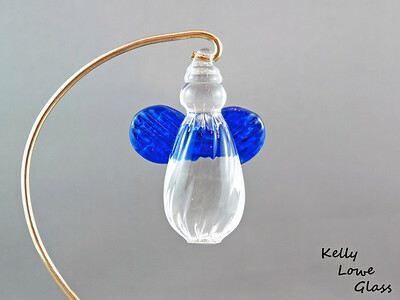 Hanging Glass Angel - Dark Blue Height: Approx 8cm (3.15") Across the Wings: Approx 5.5cm (2.17") Depth: Approx 3cm (1.19") Weight: Approx 85g (0.19 lbs) *Brass hanger in pictures is not included Please note: as each piece begins its life as molten glass and is blown/sculpted by hand into the final product, individual pieces might have slight variations in size and/or appearance. Please rest assured however that the standard of quality is quite high, and no substandard pieces will be sold. 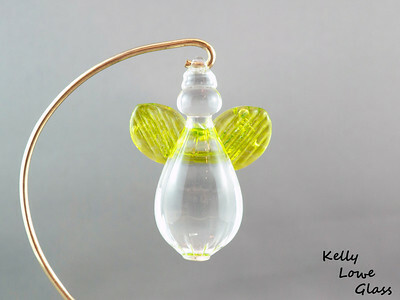 Hanging Glass Angel - Lime Green Height: Approx 8cm (3.15") Across the Wings: Approx 5.5cm (2.17") Depth: Approx 3cm (1.19") Weight: Approx 85g (0.19 lbs) *Brass hanger in pictures is not included Please note: as each piece begins its life as molten glass and is blown/sculpted by hand into the final product, individual pieces might have slight variations in size and/or appearance. Please rest assured however that the standard of quality is quite high, and no substandard pieces will be sold. 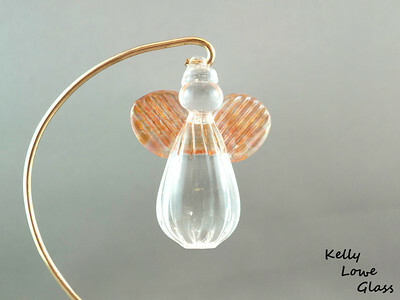 Hanging Glass Angel - Pink Height: Approx 8cm (3.15") Across the Wings: Approx 5.5cm (2.17") Depth: Approx 3cm (1.19") Weight: Approx 85g (0.19 lbs) *Brass hanger in pictures is not included Please note: as each piece begins its life as molten glass and is blown/sculpted by hand into the final product, individual pieces might have slight variations in size and/or appearance. Please rest assured however that the standard of quality is quite high, and no substandard pieces will be sold. 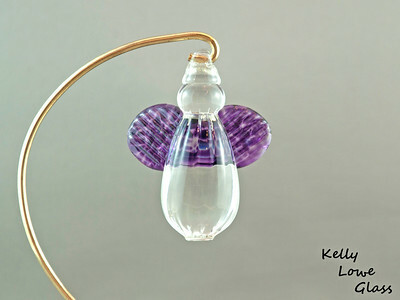 Hanging Glass Angel - Purple Height: Approx 8cm (3.15") Across the Wings: Approx 5.5cm (2.17") Depth: Approx 3cm (1.19") Weight: Approx 85g (0.19 lbs) *Brass hanger in pictures is not included Please note: as each piece begins its life as molten glass and is blown/sculpted by hand into the final product, individual pieces might have slight variations in size and/or appearance. Please rest assured however that the standard of quality is quite high, and no substandard pieces will be sold. Hanging Glass Angel - Gold Topaz Height: Approx 8cm (3.15") Across the Wings: Approx 5.5cm (2.17") Depth: Approx 3cm (1.19") Weight: Approx 85g (0.19 lbs) *Brass hanger in pictures is not included Please note: as each piece begins its life as molten glass and is blown/sculpted by hand into the final product, individual pieces might have slight variations in size and/or appearance. Please rest assured however that the standard of quality is quite high, and no substandard pieces will be sold. 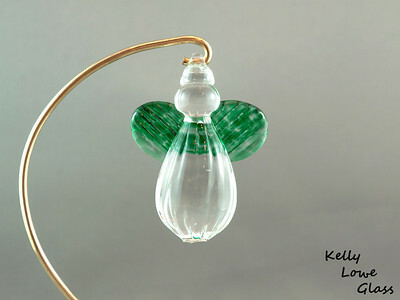 Hanging Glass Angel - Green Height: Approx 8cm (3.15") Across the Wings: Approx 5.5cm (2.17") Depth: Approx 3cm (1.19") Weight: Approx 85g (0.19 lbs) *Brass hanger in pictures is not included Please note: as each piece begins its life as molten glass and is blown/sculpted by hand into the final product, individual pieces might have slight variations in size and/or appearance. Please rest assured however that the standard of quality is quite high, and no substandard pieces will be sold. 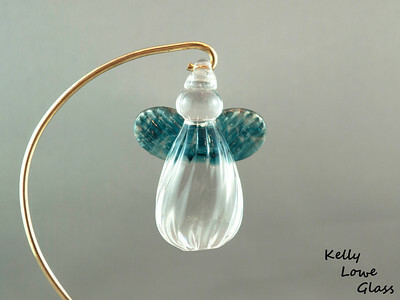 Hanging Glass Angel - Aqua Height: Approx 8cm (3.15") Across the Wings: Approx 5.5cm (2.17") Depth: Approx 3cm (1.19") Weight: Approx 85g (0.19 lbs) *Brass hanger in pictures is not included Please note: as each piece begins its life as molten glass and is blown/sculpted by hand into the final product, individual pieces might have slight variations in size and/or appearance. Please rest assured however that the standard of quality is quite high, and no substandard pieces will be sold. 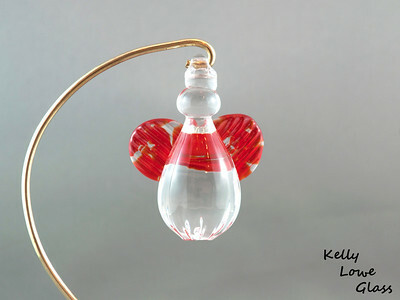 Hanging Glass Angel - Red Height: Approx 8cm (3.15") Across the Wings: Approx 5.5cm (2.17") Depth: Approx 3cm (1.19") Weight: Approx 85g (0.19 lbs) *Brass hanger in pictures is not included Please note: as each piece begins its life as molten glass and is blown/sculpted by hand into the final product, individual pieces might have slight variations in size and/or appearance. Please rest assured however that the standard of quality is quite high, and no substandard pieces will be sold. 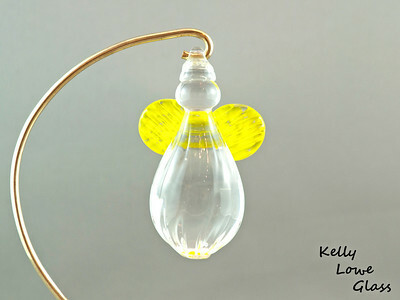 Hanging Glass Angel - Yellow Height: Approx 8cm (3.15") Across the Wings: Approx 5.5cm (2.17") Depth: Approx 3cm (1.19") Weight: Approx 85g (0.19 lbs) *Brass hanger in pictures is not included Please note: as each piece begins its life as molten glass and is blown/sculpted by hand into the final product, individual pieces might have slight variations in size and/or appearance. Please rest assured however that the standard of quality is quite high, and no substandard pieces will be sold. 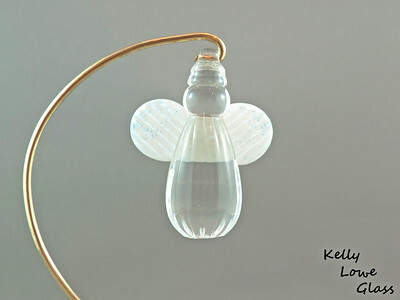 Hanging Glass Angel - White Height: Approx 8cm (3.15") Across the Wings: Approx 5.5cm (2.17") Depth: Approx 3cm (1.19") Weight: Approx 85g (0.19 lbs) *Brass hanger in pictures is not included Please note: as each piece begins its life as molten glass and is blown/sculpted by hand into the final product, individual pieces might have slight variations in size and/or appearance. Please rest assured however that the standard of quality is quite high, and no substandard pieces will be sold. 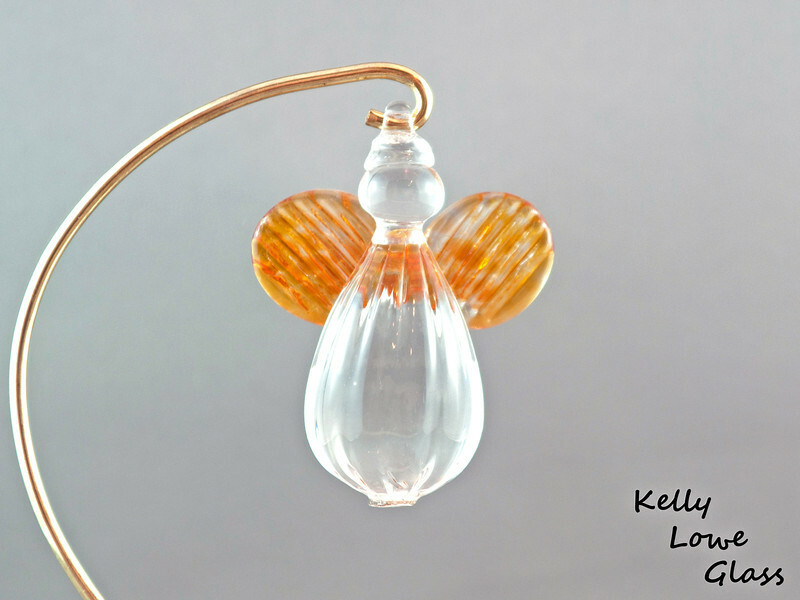 Hanging Glass Angel - Apricot Height: Approx 8cm (3.15") Across the Wings: Approx 5.5cm (2.17") Depth: Approx 3cm (1.19") Weight: Approx 85g (0.19 lbs) *Brass hanger in pictures is not included Please note: as each piece begins its life as molten glass and is blown/sculpted by hand into the final product, individual pieces might have slight variations in size and/or appearance. Please rest assured however that the standard of quality is quite high, and no substandard pieces will be sold.